These cores are cheap to build and have very poor cooling efficiency. They exist in the market because they are very easy to braze. Any manufacturer with experience in brazing radiators can come out with this kind of charge air cooler easily. In short, these coolers look like charge air coolers but they cool very little. Buyer Beware! Can withstand very high temp and pressure. Aftermarket manufacturers have widely promoted the bar-plate as it does not require tooling or skilled brazing. In a direct comparison for the same size cores, the Northern Hybrid Core has a better performance in cooling efficiency. People like bar-plate because it is very strong and has very low warranty return rates. The burst pressure is very high in bar-plate, thus normal operation pressures never approach the burst pressure. However, bar-plate is very heavy, more expensive, and less efficient than some other types of cores. 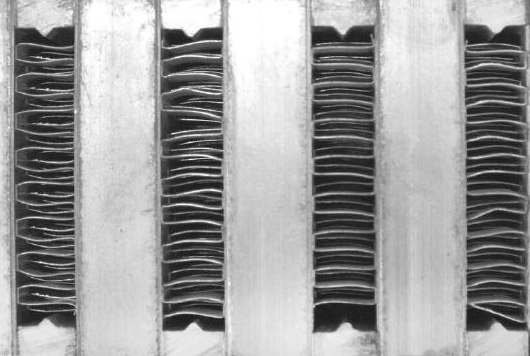 Bar-plate has different airflow characteristics: the bars typically have a flat face and do not have the aerodynamics of a round nose tube. Bar-Plate does have its place in certain high stress CAC applications, where its strength is an advantage. Best cooling efficiency but when they fail it tends to be in the four corners due to thermal expansion and contraction. Uses a combination of microfin extruded tubes at both ends of the core and stuffed tubes throughout the center of the core, effectively reducing the failure rate in the four corners. 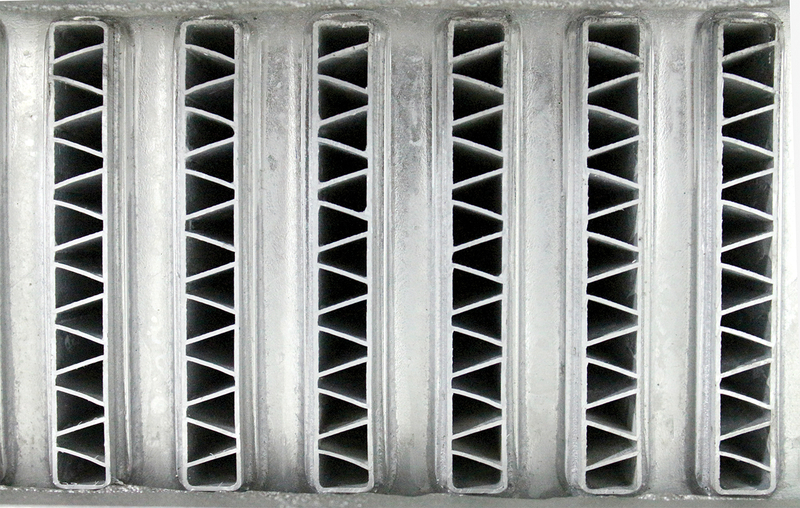 To achieve optimal cooling to strength ratio we use thicker fins than OE.